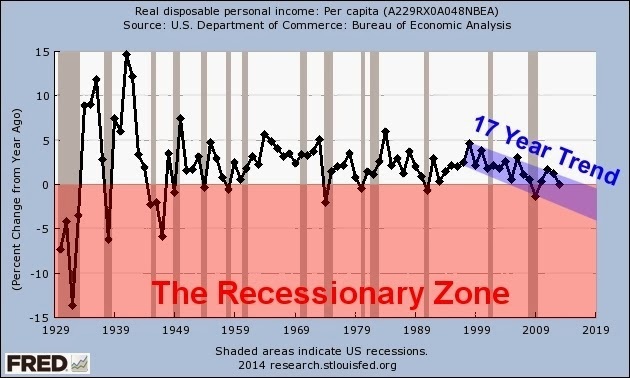 Credit Bubble Stocks: Stagflationary Mark: "Man the Lifeboats"
Stagflationary Mark: "Man the Lifeboats"
Link: "The following chart shows the annual change in annual real disposable personal income per capita. 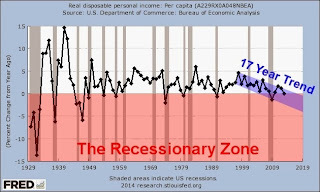 As seen in the chart, we have never successfully avoided a recession when this growth rate falls below 0%." Technically speaking, the rate is still ever so slightly positive! Don't let the 17 year trend or the short-term trend over the past few years concern you. In all seriousness, no chart can accurately predict the future, but damn. As a permabear since 2004, I see serious risks here. No desire to own stocks at these levels. Let's just put it that way. I sure see a lot of new cars on the road. What if the automakers are expanding capacity right now even though the "pent up demand" has been satiated? Don't even get me started on the auto industry! Not to mix metaphors, but the following chart has train wreck written all over it. When Will the Next Auto Industry Bailout Occur? And check this out quote from SBarro. Keep in mind that SBarro just went bankrupt a few years ago. Good grief. "Pent-down demand" - great concept. I've noticed in solidly lower-middle class neighborhoods people are driving new (2013-2014) BMWs. Because of low interest rates, these people who used to replace their beater every four years are going to have a car that could easily last a decade.